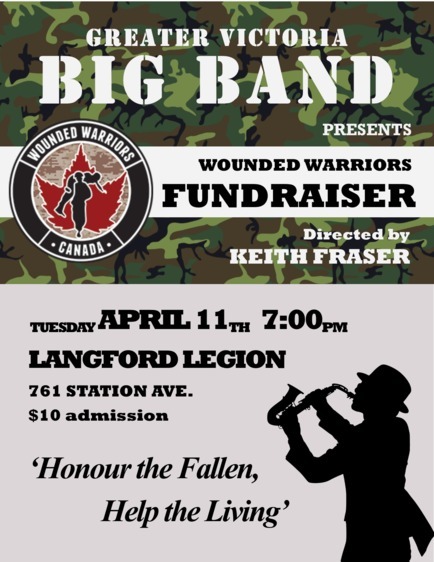 The Greater Victoria Big Band presents a fundraiser for the non-profit organization Wounded Warriors. Come join us at Langford Legion to support this worthy cause and enjoy a night of fun jazzy music! Honour the Fallen, Support the Living! The Wounded Warrior Project is a charity and veterans service organization that offers a variety of programs, services and events for wounded veterans of the military actions. Their mission is to honour and support Canada’s ill and injured Canadian Armed Forces members, Veterans, First Responders and their families.